The Faculty of Informatics and Information Technologies at the Slovak University of Technology, the largest and oldest university of technology in Slovakia, has introduced a fully-equipped eye tracking classroom, as well as an eye tracking lab. The Faculty of Informatics and Information Technologies at the Slovak University of Technology (FIIT STU) in Bratislava is the only school in Slovakia that is primarily focused on teaching and research in informatics, information, and communication technologies. 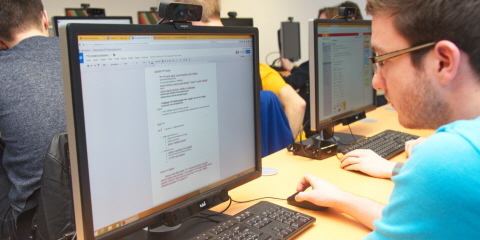 The faculty added eye tracking technology to their research techniques in order to achieve both their research and educational objectives. On the research side, they sought to enhance their user experience studies by providing a better evaluation tool than the methods currently in use. From an educational perspective, they wanted to get better insight into how students solve tasks when learning programming or studying in an e-learning environment. Teachers can use the eye tracking technology to get information and feedback could not be obtained otherwise. The faculty purchased twenty Pro X2-60 eye trackers to equip the class, as well as one Pro TX-300 and an additional Pro X2-60 with a mobile device stand to equip a user experience lab. Pro Studio software will be used for the research analysis. Eye tracking is very valuable as a methodology for both the faculty and the university. The eye tracking classroom allows the staff to conduct learning analytics while keeping the conditions of a traditional educational setting intact (a classroom setup vs. a one-on-one UX lab). These learning analytics are also in line with research projects that involve the analysis of student behavior. For example, the data can show how novice programmers look at source code and how they comprehend it, which can be used to then improve the learning process. Having a classroom equipped with eye trackers enables the faculty to gather large quantities of eye tracking data while saving the researchers' time and ensuring similar conditions for all experiment participants. The biggest value of the classroom is in the students themselves. While they are taking part in the eye tracking course, they can also run studies there for their personal bachelor, master, and doctoral projects. The capability of being able to run an efficient eye tracking study compliments their research and adds more validity to work. In addition, having the experience of working with eye tracking technology is a competitive advantage for students when entering the job market once they leave school. Future employers will benefit, as well, since they will gain employees with practical experience in usability and UX evaluation. These students will possess applied skills both in operating the eye tracking systems and conducting user studies. This will result in researchers who are more critical of their own designs and who are willing to validate their own processes, both positive habits to have in software engineering and other related disciplines. According to the university, when equipping a lab, it's important to have the right level of expectation and accept the fact that there is no out-of-the-box solution that exists. The process entails a close partnership between the company and the university. 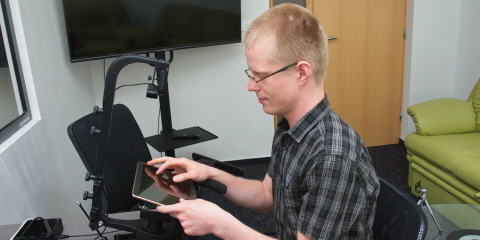 The team at Tobii Pro supported the faculty in setting up the classroom, promptly resolved unexpected issues with networking and firmware updates, and ensured that the eye tracking hardware and software was operational at all times. The company also offered a three-day training at the university to get the classroom up and running, as well as additional attention to ensuring the analytical tools that were included in the package were operational. Though setting up an eye tracking classroom can be a challenging task, the result added great value to the university's research activities, as well as the faculty and university positioning, in general.